BRAUN, Georg & HOGENBERG, Frans. 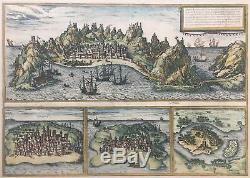 Four views of the major ports of Arabia (Yemen) and Mombaza, Quiloa and Cefala. These Indian Ocean trading ports were important supply points for traders in the Far East. Hogenberg created the tables for the first 4 volumes. Together, these two geographers created a work that set new standard for cartography for the next century. This multi port view demonstrates the high quality of their work. Old & Rare Books, Maps & Prints. Since 1925 116 East 59th Street, New York, NY 10022 New York City's oldest independent book store. Argosy Book Store, founded in 1925, is now in its third generation of family ownership. Our enormous stock of antiquarian and out-of-print items fills a six-floor building in midtown Manhattan and a large warehouse in Brooklyn. We specialize in Americana, modern first editions, autographs, art, antique maps & prints, and the history of science & medicine. We also have thousands of books in all other fields of interest. We are founding members of the Antiquarian Booksellers Association of America, and we belong to the International League of Antiquarian Booksellers and the Appraisers Association of America. The Argosy Gallery, located on the second floor of the book store, has one of the most extensive collections of antique maps and prints in New York City. A small selection of our materials are available online, but these are merely a sampling of the many thousands of pre-20th century materials in our collection. Our materials cover from botanicals to maritime maps and everything in between. Whether you have something specific in mind or just want to take a look around, you're bound to find something that delights and often surprises you. Authenticity: All items are original antiques, unless otherwise specified. Certificate of Authenticity can be provided upon request. On rare occasions the item you want may be unavailable. Please notify us before returning anything, and make sure the items are carefully packed. Framing and Archival Services: We offer fine custom framing and advise on framing challenges. We provide conservation services for all works on paper as well as conservation storage solutions. The item "ADEN, ARABIA Antique Map 1582 Braun & Hogenberg (Yemen)" is in sale since Friday, August 31, 2018. This item is in the category "Antiques\Maps, Atlases & Globes\Africa Maps". The seller is "argosy2000" and is located in New York, New York. This item can be shipped worldwide.